Fablehaven is the first book in an amazing 4-part series by Brandon Mull. In this book Kendra and Seth must go spend a two-week vacations at their grandparents' home. When they get to the home they think it's going to be a boring two weeks. Boy, were they wrong. From the first day there, Kendra and Seth knew there was something different about the house, the farm, and the woods surrounding it all. Within two days of being there, they realize it is not just any farm but a preservation for magical creatures. Before they know it, they are sucked into an epic battle of good versus evil. Brandon Mull combines humor with action, adventure, and heartfelt moments. This is a book for all ages. It is amazing and I recommend it for people who like to read fantasy and adventure. 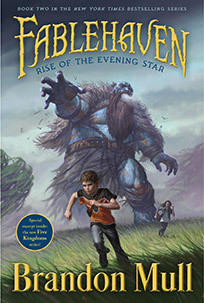 Fablehaven: Rise of the Evening Star is the second book in Brandon Mull's five part series. In this book Kendra and Seth have just finished the school year and are ready for another summer under the sun. But things don't pan out when a man claiming to be a friend of their grandpa sends Seth on what seems a harmless mission to feed a statue of a frog but things go terribly wrong. This man is secretly a member of the Society of the Evening Star wishing to infiltrate the preserve belonging to Seth and Kendra's grandparents to steal the secret artifact. Kendra and Seth manage to get the preserve safely but their problems have just begun. Brandon Mull does a great job of making his fantasy contain a touch of realism that allows readers to connect with the characters. This is a great book for children who like to read fantasy and adventure novels. Fablehaven: Secret of the Dragon Sanctuary is the fourth book in Brandon Mull's five part series. In this book, two of the critical artifacts have already been discovered by The Sphinx. It is not until Kendra finds secret instructions left by the late Patton Burgess on how to find the next artifact that anyone has hope. The only drawback is that she has to go into a dragon sanctuary. In other words this is a suicide mission. Kendra and the best warriors of The Knights of The Dawn must embark on this scary mission. You'll have to read the book to see who survives. Brandon Mull has masterfully crafted this fantastical thriller with countless twists and turns. This series is a great read for people of all ages. From fantasy fanatics to adventure addicts, this book is great and anyone can enjoy it. Veronica Roth's Divergent Roth is an extraordinary book that keeps you on the edge of your seat! It's about a city split into factions based on beliefs. Now that the main character, Beatrice is sixteen she can choose her own faction. This a hard decision for Beatrice because she has grown up as a selfless girl in one faction but she has never felt like she fit in. She has always admired another faction for their fearless approach to living. Once she chooses a faction that surprises her family, her life changes immediately. This story has action, adventure, and romance. This book keeps you thinking about the what future society could be like. This book is the second in the Mortal Instruments series. Read the first before looking! The second instalment is better than the first, with more action and intrigue to delight fans. Clary's life has fallen apart. Her mother is in a coma, her past life is a lie, and the boy she thought she loved is her brother. Of course, maniacal fathers rarely take into account their daughter's problems when plotting evilly. Bodies of downworlders are turning up, drained of blood. All leads point to Valentine, but are Jace and Clary ready to face him again? To make matters worse, the Inquisitor has arrived and is twisting the Law to get what she wants most: revenge. This book is probably the best in the series, with emotions raw and surprisingly real. The final show-down is good, if a little fake, but a plot twist at the end that saves Simon leaves the reader confused. For fans of the series, this book fulfils the promises of the first. However, if City of Bones was not your cup of demon blood, don't pick up the second. A good, but not great, read overall. This book, and most of the following series, is purely enchanting. It all starts when Nita Callahan seeks shelter from bullies in the career choice section of her beloved library. She wanders through the titles until one catches her eye: So You Want to Be a Wizard. Thus starts a grand adventure with her new partner, Kit Rodriguez, through New York and the Other New York, chasing the ultimate evil. This book gives the reader everything and anything one could want from a science-fiction novel. The explanation of magic is thorough, and a little advanced for younger readers. The bonds of friendship are strong, and fantasy is woven into every turn, from conversations with trees to walking on air. I would recommend this book to middle school age readers. Parts of the book are for older readers, but they are not inappropriate. Older readers may find the book a little young, and it does follow the conventional plot. However, it is well written and a brilliant book. O lord. This book is … inconceivable. It is hilarious, tender, sarcastic, exciting, magical, and blows the mind faster that Fezzic can rhyme the word “amazing”. It all starts with Buttercup, an amazingly ditzy and selfish girl, albeit the fifteenth prettiest. She falls in love with the stable boy, they kiss, he set off to win his fortune, and dies. This is all within the first few chapters. What follows is what Juliet died to escape. Now the unloving bride of a mostly-evil prince, Buttercup is kidnapped by a miniature genius, vengeful Spanish sword-wizard, and a poetic strongman. True love is found, then lost, then found. Epic duels are fought, and a rapier wit is wielded by Morgenstern that makes you roll on the floor laughing. I would recommend this book to anyone old enough to enjoy satire in its fullest, but young enough to believe in giant sharks and R.O.U.Ss (rodents of unusual size), and brave enough to venture into a fire swamp with the dread pirate Roberts. Amazing! Tamora Pierce has done it again. She has taken us back to Tortall (this time in the past) and made the lower city a place of dark magic, where anything can happen and frequently does. The story is written diary-style, but most of the time it seems like a first person narrative. This is not necessarily a fault, as it does add more detail, an odd occurrence in Pierce's work. The stage is set with a young girl, Beka, who has spent the last eight years working for the Lord Provost, who saved her and her family from the slums of Corus. She harbors the odd dream of becoming a Dog, the police of the capital city. One who has read the Alanna books will recognize little but the Rouge and Faithful (he's back, just under a different name! ), as the book is set in an element far removed from the elegant palace. By stepping out of her comfort zone, Pierce creates a masterpiece that looks on the mostly ignored others of the middle ages. I would recommend this book to anyone in their teens or older, as it does have some sexuality and adult subjects. It is a great book, and works like magic on the reader. Beka is shy but brave, a different type of heroine. However, as I said before, this book breaks all conventions of high fantasy books and does it well.